Hassanal Bolkiah was born on July 15, 1946. He assumed the power on October 4, 1967 after abdication of his father. Official ceremony of coronation was held on August 1, 1968. At the time of Bolkiah's coronation, Brunei was the British protectorate. The country gained full independence from the crown in 1984. Now Sultan is the head of the state and a religious leader. The right to succeed to the throne is inheritable. Proclamation of independence from Britain is not the only one major achievement of Bolkiah. During his sultanate a number of educational institutes were established and built. 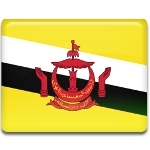 The Armed Forces of Brunei were were expanded. Medical treatment and medicine is free to children, members of the Armed Forces and policemen. Sultan Hassanal Bolkiah is one of the richest persons in the world. In 2008, Forbes estimated his total peak net worth at US$200 billion. Sometimes the celebration of Sultan's birthday is moved to August, because the actual birthday falls during the month of Ramadan, which is observed as a month of fasting.